I am delighted to join you today for the opening of the Asian Actuarial Conference. It is the third time this prestigious event, previously called the East Asian Actuarial Conference, has taken place here in Hong Kong. It gives me great pleasure to welcome so many distinguished members of the actuarial profession to Hong Kong. I'm told that there are nearly 700 of you here for the four-day Conference, from more than 20 countries and regions all over the world. I hope the stormy weather brought by Super Typhoon Mangkhut has not caused too much disruption to your travelling plan. We actually have a full house this morning. The last time this event was held in Hong Kong was in 2001, some 17 years ago. Naturally the world has changed significantly in almost every aspect, and Hong Kong is no exception. We are now into the fifth term of the Hong Kong Special Administrative Region Government, under a first lady Chief Executive, but I would assure you that the principle of "one country, two systems" and a high degree of autonomy are as robust as ever. There is a saying that "life is full of uncertainties". Just when everyone was predicting a bright outlook for the global economy at the beginning of the year, and such positive sentiments prevailed when I attended the World Economic Forum at Davos in January this year, the United States has now imposed unilateral trade measures against Mainland China and some other economies, casting a cloud over future economic prospects. While terrorist attacks and a trade war are of course of completely different nature, I think these events show that black swans do exist and there are always risks in the world. The increasing natural disaster risk, as shown by Typhoon Mangkhut, which was the strongest tropical cyclone hitting us in decades, is another case in point. We cannot avoid risks, so the best we can do is to understand, predict, calculate and manage them. It is no doubt a task which is easier said than done, but thankfully we have the help of actuaries. I know that the Casualty Actuarial Society and the Society of Actuaries - both organisations are well represented here today - describe an actuary as "part superhero, part fortune teller, part trusted advisor". I am not sure if actuaries can actually fly, but I think the description reflects the importance as well as the complexity and difficulty of their job. Being the leading professionals in finding ways to manage risk, actuaries do need to have very strong analytical skills, business knowledge and understanding of human behaviour in order to perform their functions. We live in a fast-changing world with emerging risks, but they also represent opportunities as we look for more creative ways to tackle them. The spectrum of topics at this Conference proves my point, which range from artificial intelligence and cybersecurity to Insurtech, longevity risk, the growth of online insurance in Mainland China and the Belt and Road Initiative. These topics and the issues they reflect underline three major developments, which are of interest not only to actuaries and the insurance sector but to policymakers as well. I'm talking about the challenges of our aging population, the impact of new technology and the burgeoning opportunities opening up, thanks to the continuing economic development of Mainland China. Allow me to share with you my thoughts on each of these areas for the next few minutes. The first topic is aging population. There is no better place in the world to talk about this topic, for Hong Kong tops global rankings in life expectancy. Men in Hong Kong are living on average up to 81.3 years and women even longer, at 87.3 years, as of 2016. According to our projection, by the year 2066, the life expectancy at birth will be 93.1 for women and 87.1 for men here. In 2026, less than 10 years from now, the number of the elderly aged 85 or above will be the same as children aged below 5. The number of elderly aged 65 or above stood at 16.6 per cent of our population at 2016 and will rise to one in three of the population at 2036, but these days I have chosen to refrain from using elderly figures at the benchmark of 65 as men and women at 65 are really not old. And I am approaching that age. We are seeing many centenarians in Hong Kong now, and they will be even more common in the future. While we are glad to see our people live longer, society will need to get prepared. For one thing, the amount of money sufficient to support life for about 20 years after retiring at the age of 65 is very different from the amount needed when expected life is 100 years. For governments, the challenge involves redefining concepts such as middle age. Policymakers will also need to reconsider social and physical infrastructure to meet the needs of a population that is expected to live for 100 years. Several years ago, the Geneva Association, a think tank established by insurance institutions, addressed the "Challenge of Global Ageing," from funding issues to insurance solutions, in a report. The Association's report suggested six critical strategies, namely reduce pay-as-you-go benefit burdens, strengthen old-age safety nets, increase funded retirement savings, encourage longer work lives, encourage higher birthrates and increase immigration. Hong Kong has been implementing policies that are more or less in line with these strategies. They include increasing the old age allowance for the elderly with inadequate retirement arrangements and increasing statutory paternity leave, reviewing statutory maternity leave and expanding child care facilities to better support parents. We recently launched a public life annuity, with a guaranteed monthly payment for life at an expected internal rate of return of 4 per cent. The goal is to help the public enjoy a stable income after retirement. As actuaries, you know how difficult it is for business and insurers to issue commercially viable life annuities, given the low-interest environment and longer life expectancy. That's why this gap has to be filled by the public sector. We will also introduce tax incentives, encouraging people to take out deferred annuities from insurers and make voluntary contributions beyond the Mandatory Provident Fund system, Hong Kong's occupational retirement scheme. We want the people of Hong Kong to save early and save more. Naturally we would be interested in how insurance can hedge longevity risk. We believe that an aging society will create opportunities for the insurance sector. Alongside long-term financial planning products, there could be new demand for insurance against infirmity risk. And for actuaries, my prediction is that your data analytics and risk-management techniques will be used more intensively for policy formulation by governments in managing their aging populations. Talking about predictions, the use of predictive analytics by actuaries to help insurers in pricing insured risks, detecting fraudulent claims and market segmentation has been developing fast. At the same time, Insurtech applications, from conversational artificial intelligence to blockchain-based insurance contracts, are set to disrupt the insurance industry. Cyber-risks lead to the demand for cyber insurance, together with expertise to help the insured and insurer quantify their exposure to cyber risks. How best to use technology and encourage innovation is critical to both public- and private-sector decision-makers. Hong Kong embraces technology and welcomes talent. At the regulatory level, the Insurance Authority has introduced a sandbox approach, as well as fast-track approval arrangements to encourage Insurtech start-ups. And my Government is targeting a range of measures to promote innovation and technology. These include tax incentives to encourage R&D, with a 300 per cent tax deduction for the first HK$2 million eligible R&D expenditure by corporations, and a 200 per cent deduction for the excess. There’s no limit on the expenditure eligible for this tax deduction. The Government will make use of a HK$2 billion scheme under the Innovation and Technology Venture Fund to invest, together with venture capital funds, in local technology start-ups. We have also introduced a HK$500 million Technology Talent Scheme to boost our technology talent. And we've just announced a Talent List, which has been designed to attract quality professionals to Hong Kong to accelerate our development into a high value-added and diversified economy. That list currently focuses on 11 in-demand professions, including actuaries. So, for any of you who would like to practice in Hong Kong or plan to start an Insurtech company, you are most welcome here. Still with technology, we are developing with the Shenzhen Government the Hong Kong/Shenzhen Innovation and Technology Park, which is located in a place called Lok Ma Chau Loop between our two cities. Shenzhen, a fast-rising innovation hub, is home to IT giant Tencent and the innovative insurer Ping An. The technology park will play a critical role in the emergence of the Guangdong-Hong Kong-Macao Greater Bay Area, which links Hong Kong, Macao and nine prosperous cities in the Guangdong province. Together, the Greater Bay Area counts a population of close to 70 million and a GDP of some US$1.5 trillion. Such economic and consumer clout can only mean bigger market potential for Hong Kong companies and the global companies that partner with Hong Kong. That certainly includes insurance. We are now actually working to gain greater and wider access to the Greater Bay Area for Hong Kong insurers. 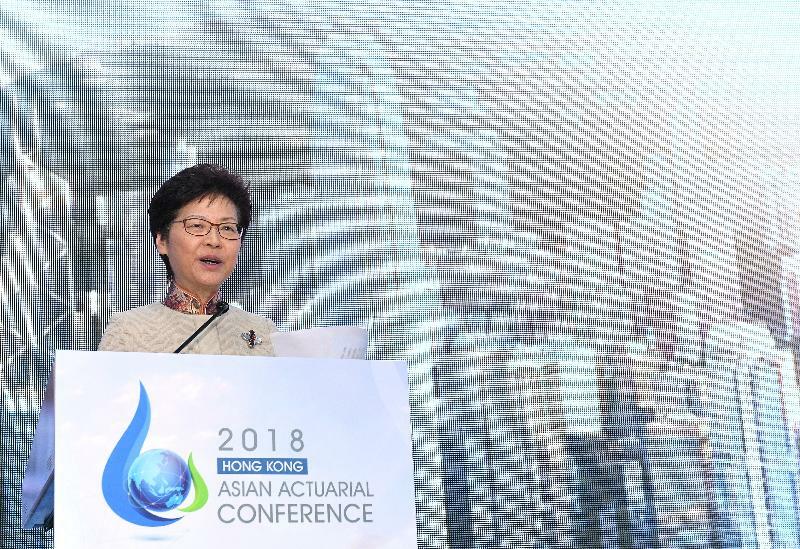 In particular, we are working to get agreement from the Mainland regulatory authorities to allow Hong Kong insurers to set up service centres in the Greater Bay Area, which will help Mainland policyholders and Hong Kong policyholders working or residing in the area in making claims and accessing other after-sale services. At the same time, we are in discussions with the Mainland authorities to enable the distribution of Hong Kong insurance products throughout the Greater Bay Area, and to allow Hong Kong-headquartered life insurers to establish majority-owned entities in the Mainland, thereby expanding both opportunity for the industry and choice for the people. Then there's the Belt and Road Initiative, which will create opportunities for Hong Kong at a considerably more expansive geographical level. I know that a plenary session on the Belt and Road Initiative will follow my speech, so I'll keep this brief. I would just emphasise that Hong Kong will play a significant role in the Initiative. We are an international financial centre, regularly cited as the world’s freest economy. We are also China's international financial capital, home to the largest pool of offshore Renminbi. In short, Hong Kong is a natural fund-raising centre for infrastructure, investment and production projects, and a natural hub for project management, given our extensive professional services prowess. That includes risk management, insurance and dispute-resolution services that our Belt and Road partners and their projects may well need. In this regard, my Government has been working very closely with the Insurance Authority chaired by Dr Moses Cheng to enable the development of captive insurance, marine insurance and the underwriting of specialty risks in Hong Kong. We are now considering new tax incentives to fast-track these lines of insurance, together with measures to promote the issuance in Hong Kong of such insurance-linked securities as catastrophe bonds. These and other measures are sure to boost Hong Kong's status as an insurance hub and risk-management centre, and will surely help us seize the boundless opportunities arising from the Belt and Road Initiative. Ladies and gentlemen, chance favours the prepared mind. 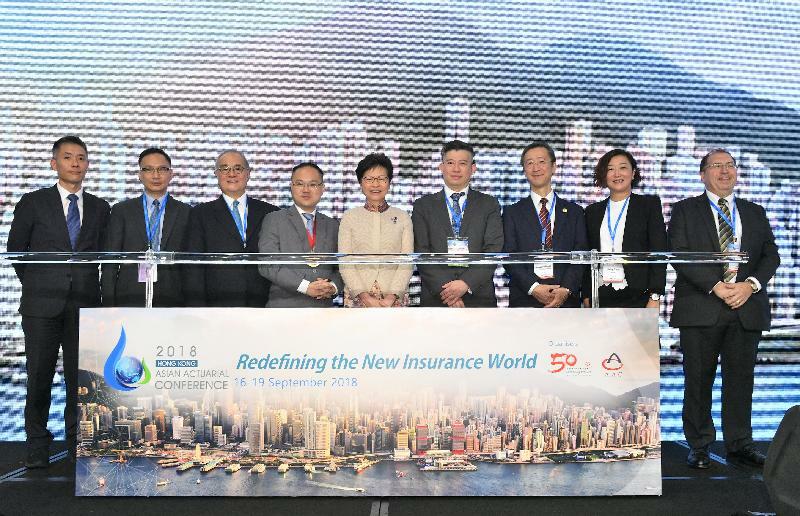 Hong Kong has been sharpening its competitive edge to capture opportunities ahead, and our fundamentals as an insurance hub will be further strengthened. So for actuaries like you, Hong Kong is where you want to be, today and long into this 21st century of opportunity. My thanks, once again, to the Actuarial Society of Hong Kong for organising the 2018 Asian Actuarial Conference. I wish you all the best of business at the Conference and a very happy stay in Hong Kong. Thank you very much.